Onychomycosis is a general term that means any fungal infection of the nails. It is not specific for which type of fungus or yeast that may be causing the infection. The fungus grows under and within the toenail. The nail as a consequence turns yellow to brown in color with occasional little white patches and overtime becomes thickened. Onychomycosis is generally not painful but the change in the shape and thickness of the nail may cause pain to the surrounding nail tissues. The change in the nail shape due to fungus can cause increased curvature on the sides of the nails resulting in pinched or ingrown nails. Shoe pressure on the very thick nails may also be a source of pain. Dermatophytes, or living fungi, are the primary cause of the fungal nail infection. They live in many common places such as locker rooms, around swimming pools, showers, gardens and even on unsterilized manicure or pedicure tools that have been used on others with the infection. Most infections are caused when the dermatophytes get under the nail following an injury, such as dropping a heavy object on your foot, stubbing your toe, trimming nails too closely, or micro trauma from wearing too tight of shoes. Acrylic nails or nail polishes can even provide a protected place for an infection to grow. Because it is an infection, it can spread to other nails. Something as simple as an emery board can carry the fungus from an infected nail to an uninfected one. Fungal nail infection will not go away on its own. If not treated effectively, the infection can spread or cause pain. The infection may also lead to bacterial infections, such as an infected ingrown toenail. Onychomycosis affects 5% to 15% of the U.S. population. The incidence increases in the elderly with almost 50% of patients more than 70 years old being infected. Patients with diabetes are two to three times more likely to have onychomycosis than those without diabetes. Diabetics who have onychomycosis have a significantly higher incidence of foot ulceration and foot gangrene than those without diabetes. Patients with circulatory problems or weakened immune systems are also at increased risk for fungal nail infections. In addition, it appears to be more common in people with a history of athlete’s foot (a fungal infection of the skin) and people whose feet perspire a lot. 1) Distal subungual onychomycosis (DSO) is the most common. The infection begins in the skin around the nail plate. Some unspecified trauma causes a break in the seal between the nail and the nail bed at the end of the toe. The fungus can then enter underneath the nail. The fungus produces thickening of the skin under the nail, which in turn lifts the nail from its attachments. As the nail lifts, the fungus progresses forward on newly exposed nail bed. This results in a thickened, discolored, crumbly nail with debris underneath. 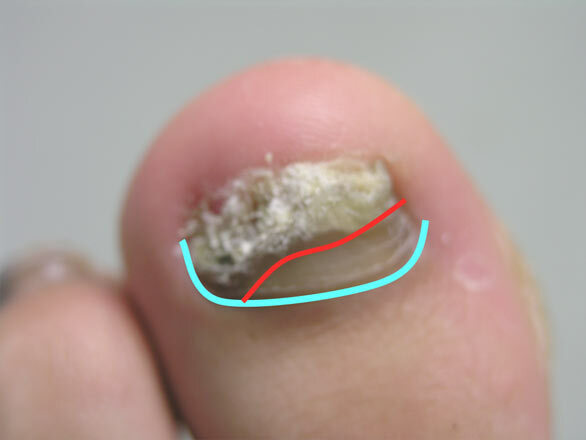 2) White superficial onychomycosis (WSO) is a direct attack on the superficial layers of the nail, not the nail bed. It presents as a “chalky” white appearance on the top of the nail. There is no thickening or debris forming under the nail. 3) Proximal white onychomycosis (PWO) is an infection of the proximal portion of the nail (near the cuticle part of the nail) as opposed to the distal or superficial invasions. It is believed that the fungus attacks under the nail from the cuticle aspect of the nail. Once the fungus becomes well established under the toenail, it is very difficult to completely cure. Nevertheless, there are a number of methods to address this condition. Periodic nail trimming, filing, grinding, or debridement. This method may be considered if toenails are pain free with widespread fungal infection. To prevent the nails from becoming painful, keep them well trimmed and thinned. Medicare considers the treatment of onychomycosis a covered service only if the above conditions are present. Topical antifungals are available both as over-the-counter and prescription. However, there is only one FDA approved prescribed topical antifungal product, Penlac (ciclpirox nail lacquer 8%). Penlac is indicated for mild to moderate onychomycosis without cuticle region involvement. The complete cure rate is low compared to oral antifungal medications. Multiple studies show a cure rate of 20%. However, it has practically no side effects or drug interactions. It is applied to the nails once daily or every other day for 6 to 9 months, or until the nails clear. Routine debridement of the buildup will help the penetration of the medication. Penlac may or may not be covered by your insurance. Over-the-counter topical may be more appealing due to its cost effectiveness. The use of oral antifungal medications alone or in combination with on of the above treatments is the most effective treatment for onychomycosis. Oral medications may eliminate the fungus and produce a nail with a healthy appearance. The preferred medication is Lamisil 250 mg once a day for three months. Even though Lamisil is a relatively safe drug and generally safe to take with most other medications, the tablets should not be taken by those with liver or kidney problems. Rarely, serious side effects in the liver or serious skin reactions have occurred. A simple blood test can be performed to check for any potential liver problems. Other side effects include headaches, diarrhea, indigestion, rash and taste disturbances. Mycologic cure rates with Lamasil oral antifungal therapy appear to be around 70% with reinfection occurring 15-20% within the first two years after the discontinuation of therapy. Long term preventative maintenance is then recommended to avoid recurrence of the fungal infection. With recurrence rates high post treatment it is recommended that preventative long term measures be pursued to prevent reinfection. Spraying shoes with over the counter fungicidal, treating any athlete’s foot with topical Lamasil cream, applying topical Penlac 8% lacquer to the previously infected nails once weekly long term. Onychomycosis insensitive to systemic terbinafine and azole treatments reveals non-dermatophyte moulds as infectious agents. Efficacy of debridement alone versus debridement combined with topical antifungal nail lacquer for the treatment of pedal onychomycosis: a randomized, controlled trial. Long-term follow-up of toenail onychomycosis caused by dermatophytes after successful treatment with systemic antifungal agents. Many doctors and pharmacists now recommend Tineacide over any other tropical product or oral prescription drug. Tineacide is a medically proven, non-prescription cream that absorbs quickly to kill the fungus that can infect fingernails and toenails. This revolutionary, doctor tested and approved, pedicure appliance smoothes callouses and removes dry skin on heels and toes in seconds, without the use of harsh chemicals or dangerous blades. Dr.'s Remedy Enriched Nail Polishes appeal to health-conscious women, including pregnant women, because it removes the potentially harmful additives found in most commercial nail polishes. Created, tested, and prescribed by doctors. Curved jaws fit the contour of the nail, making cutting easier; double spring to ease the pressure needed to cut the nails, stainless steel construction for a long lasting medical grade instrument. Such as anti-fungal soap, nail polishes, cleansers, tea tree oil, and pedicure kits.